Garvey Auto Group, an Auto/Mate customer since 2000, was suffering from an issue plenty of dealerships face in the service department: double booking and service appointments scheduled during blocked off hours. 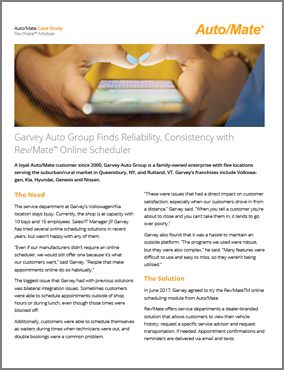 It wasn’t until 2017 that Garvey started using Rev/Mate, Auto/Mate’s online service appointment scheduler, that the dealership eliminated its problem. Rev/Mate offers service departments a dealer-branded module that allows customers to view their vehicle history, request a specific service advisor and request transportation, if needed. Appointment confirmations and reminders are delivered via email and texts.